Handwritten letter on blue Ministry of Food headed paper bearing address in Portman Square, London and ministry crest in blue. 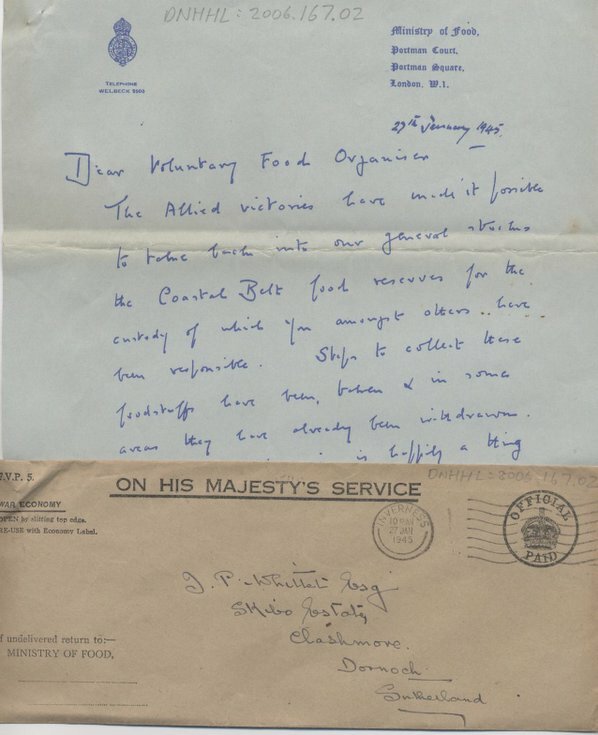 Letter dated 27th January 1945 with salutation, 'Dear Voluntary Food Organiser' thanking Mr Whittet for his services as Food Organiser during the course of the war. Accompanying brown envelope bears Mr Whittet's address, has an 'Official Paid' stamp, heading on the envelope 'ON HIS MAJESTY'S SERVICE' , reference number 'FVP 5' and annotation 'War Economy'.